Are you on giveaway overload yet? As most of you probably know it is Back To School time! A group of blogging colleagues decided to put together a great fall giveaway. 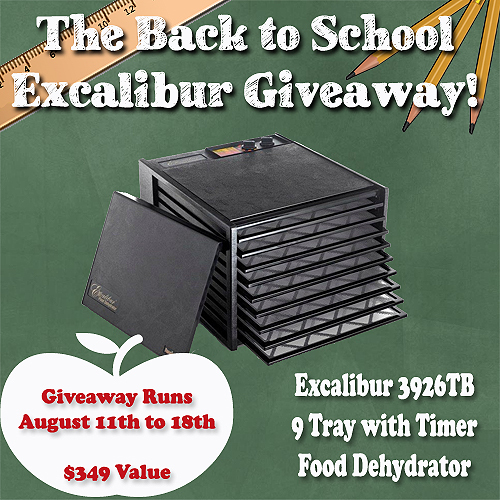 What is better than an Excalibur 9 Tray Dehydrator with a timer? Our gardens or farmers’ market are in full swing ready to provide the produce so we can dehydrate most fruits, vegetables, meat or herbs. If your name is chosen as the winner what would be the first items you would like to dehydrate? We would love to hear from you! 14. Are We Crazy Or What? This giveaway is open to any resident 18 years of age or older living in the 48 Continental US States. The giveaway starts on Aug. 11th at 5:00 am (MDT). We will choose a winner at the end of the giveaway on Aug. 18th, 2014 at 5:00 pm (MDT). We will email the winner that is chosen and they will have 24 hours to respond to the email sent to them. If after 24 hours we do not hear from said winner, another winner will be chosen. Thanks again for entering and good luck to all! 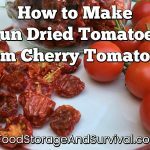 There are too many things I want to dehydrate to try to choose the first, but probably my herbs as they would be so much better than the store bought ones.